If you count the coast of the Gulf of California, or the Sea of Cortez, as the Mexicans call it, we spent about half of August and September staying in big and small beach resorts on the Mexican Pacific Coast. We didn't by far see, taste, or smell all of them, but we did get what we think is a representative idea of the area. If you don't want to read much further and just want to know where to go here's the answer: The overall winner for us was Puerto Vallarta. We have to confess that is because it was most like America, and by the time we got there we were ready for a taste of America. And just what do we mean by "America"? Well, it's really a cultural thing, being at ease. The place was cleaner, the folks spoke more English, the food was nearer to what we were used to, etc. But let's save the rest for its chronological place. We entered Mexico late in the day on August 1, and after a night at the border went south 100km to Puerto Penasco, or as the gringo snowbirds call it, Rocky Point. The place is a dump. Or more exactly, it has potentially fine beaches and is in the early stages of development that will make it into a Mexican version of Ocean Beach, Maryland. The rather scruffy Mexican fishing village and the new high class developments targeted at los norteamericanos are a world apart even if physically they are separated by only a kilometer or two. Puerto Peñasco, the closest to the U.S. Border, and a fairly popular weekend destination for Tucson residents was surprisingly the least developed. Changes in Mexican law to accommodate NAFTA have produced lots of building of both hotel accommodation and private villas and apartments but the influx of dollars is directed mostly at new neighborhoods out of town and is only slowly being felt in the old fishing village. While we were there a new seafront promenade was being built with the requisite statue of the fisherman but wasn't far along to do anything but detract from the atmosphere of the place, which was, admittedly, a bit grungy. It should be noted that while Americans do "buy" property, the law only allows ownership to be indirect, via some kind of trust arrangement. And while Americans can enter Mexico visa-free for brief across-the-border forays, tourist visas are required for stays up to six months and one-year or five-year resident permits are required for longer stays. Our next ocean stop was at Bahia Kino, named for Father Eusebio Francisco Kino, founder of many missions in northern Mexico and Texas. We got there from Puerto Penasco by heading east and then south to Hermosillo, the desert capital of the desert state of Sonora. 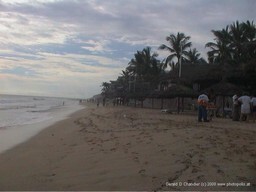 Slightly more than an hour west is this beach resort, even less developed than Puerto Penasco but also less scruffy. Whereas in PP we only managed a stroll along the beach, in Bahia we actually took a brief dip in the Sea of Cortez but didn't hang around for lack of protection from the midday heat. 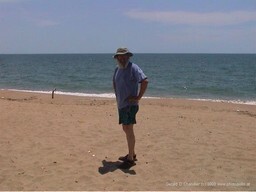 Here we are getting ready for a dip at Bahia Kino. 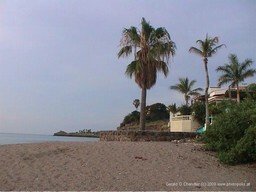 As you can see we had the beach almost all to ourselves. Not too surprising considering it was a Monday around noontime. 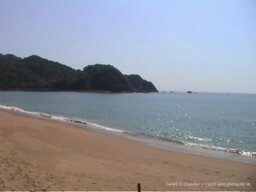 The beach is probably packed on weekends and weekday evenings when all the locals come to cool off. Since there weren't any waves and the beach had absolutely no shade at this time of day, it wasn't Gerry's favorite place, but as beaches go, it is a very pretty beach. We didn't think the water was too clean, though. Next stop was San Carlos just north of the fishing port of Guaymas. Another favorite snowbird destination, it had snowbird prices. So we were happy to find ourselves a cheapish motel room with a kitchenette run by Lenora and her Canadian boyfriend, Dean. 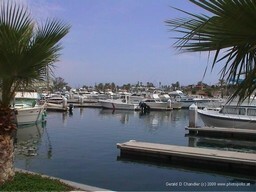 San Carlos is best known for its marina and wonderful natural harbor. We took a half day kayak tour with Dean and were delighted to actually see a dolphin in the wild. We found great sandwiches at the Marina Cantina and lots of other Americans enjoying them too. We were lucky to be in San Carlos when a phenomenal summer storm passed through and were witness to the most amazing series of lightning bolts we have ever seen. Bolts were tree-structured, snake-like, everything but your normal forked lightning. The storm was preceded by a most unusual cloud formation, white on top, pitch black underneath and accompanied by a howling wind but hardly any rain. 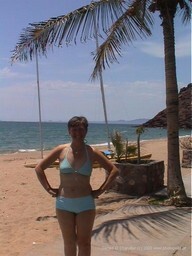 Mazatlan was our first experience of a "four-star" Mexican beach resort. Actually there are more five-star resorts here than you have had hot dinners. 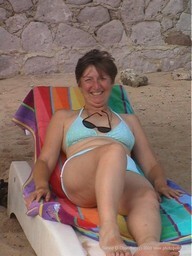 Here's Jan working hard at relaxing on the beach at Mazatlan. 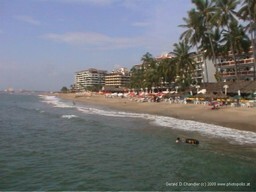 This beach was in front of the hotel across the street from ours. Fortunately they didn't object to scroungers like us using their beach loungers. And yes, Gerry really went in. 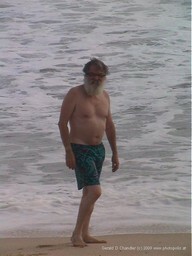 This is before, even if it does look as if it is after the waves tried to claim his suit. The waves you see here are another reason according to Gerry (Jan strongly disagrees) that the ocean was a better bet than the hotel pool in Mazatlan, which wasn't beachfront and was a bit grungy. Real waves that one could play in, courtesy of a recent off shore hurricane that decided to pay its main visit to a part of the Gulf of California a bit farther north. Puerto Vallarta was a bit of a surprise to us in that we found it more affordable than Mazatlan, more friendly, and more affluent. Like Mazatlan, there are three PV's. 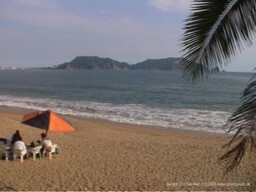 The first is a Mexican beach town, with guesthouses, small hotels, shops, restaurants, and residential areas. The second is a 20-year old resort area that stretches along the beaches north of town that caters to middle-level package tourists from Mexico and abroad. The third is a mega-resort area that is 10 miles north of old PV where each resort is self-contained and designed for the high-price package tourist. We, of course, stayed on the edge of Old PV in a small beachfront hotel that had modern rooms overlooking the beach, a lovely beachfront pool, BUT no parking garage or parking lot. We parked across the street from the front door of the hotel so that the night porter could more easily keep an eye on the car. 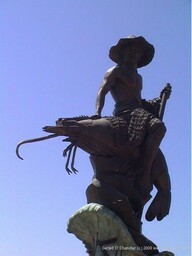 Puerto Vallarta was like Mazatlan in another way. It was fairly easy to earn a couple of hundred dollars. All you had to do was be willing to attend a time-share resort sales pitch and convince the sales team that you were a potential catch. That meant convincing them that you had the money to buy, were a married couple (we had a bit of trouble with that one because of having different last names), and lived and worked in the U.S. We managed fine in Mazatlan, but dropped the ball the first time in PV when Gerry let drop that we were planning to spend several months in Mexico. Next time around we had learned our lesson. 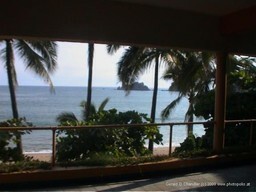 San Patricio de Melaque is our favorite Pacific Beach Resort so far. It was cheap, uncrowded, uncommonly beautiful and oh so relaxing. There were enough waves to keep Gerry from total boredom, but not so huge that Jan wouldn't venture in. It was hot enough to make bathing a pleasure, but our terrace captured a cool breeze all day long. All in all a pretty perfect place. 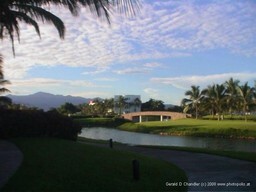 La Barra de Navidad is just a few clicks from Melaque on the southern edge of the bay. 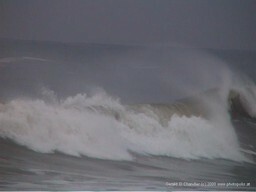 It is famed for big surf in the winter months and so very popular with surfing enthusiasts. 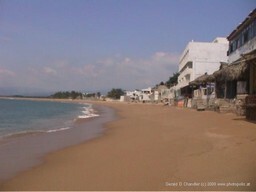 When we were there, as the photos testify the waves were none-existent, so the village was very quiet. We ate lunch at a beachfront restaurant, then wandered the streets and checked out the hotels before driving back to Melaque very content with our Hotel Monterrey and its terrace.